*Act now before they disappear forever. This is one of our final Continentals of a generation and represent unique opportunities for you. Please contact one of our Bentley Specialist to take advantage of these offers. * 2017 Bentley Continental GTC V8 is Beluga with Beluga interior. Nicely optioned with bright chromed lower bumper grille, ventilated front seats with massage, knurled sports gear lever, all seasons specification, interior style spec. 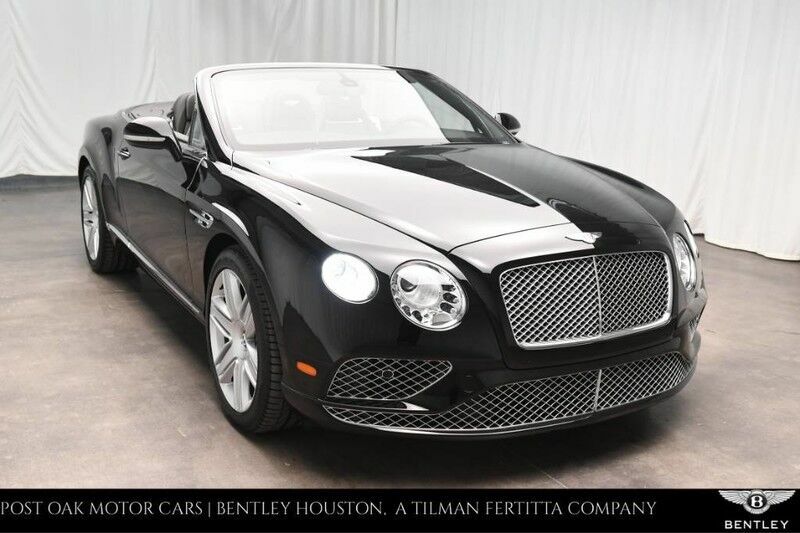 w/contrast stitch, drilled alloy sports foot pedals and embroidered Bentley emblems.----------------------------------------Bentley Houston is part of the Post Oak Motor Cars dealership, a Tilman Fertitta Company. A New Experience awaits you at our dealership! We are located in the elite Post Oak Complex, complete with elegant accommodations, high-end fashion, fine dining, luxury spa and other sophisticated amenities. Our dealership features state of the art service center, parts and accessories boutique along with Bentley Certified Brand Representatives that can assist you with any questions you may have about financing options and pricing details for this vehicle. Our team can also assist you with enclosed transportation and valuing your trade-in. Give us a call or simply come by the dealership for a test drive.